Tesco has set its sights on the discounters, Aldi and Lidl, with the launch of Jack’s, a new discount format named after the retailer’s founder Jack Cohen. The retailer has designed Jack’s to operate a low-cost business model, with a simplified range of products, no fancy fixtures or fittings, and no added extras. The first stores will be in Chatteris in Cambridgeshire, and Immingham. Plans for the new format started to leak out in July after Tesco started advertising for staff for a number of new format stores. 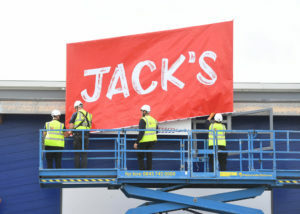 Over the next six months Tesco will launch 10-15 Jack’s stores in the UK. The first two stores will open on 20th September in Chatteris, Cambridgeshire and Immingham, Lincolnshire, on sites which make use of excess Tesco space. The stores to follow will include a mix of entirely new sites, sites adjacent to existing Tesco stores, and a small number of converted Tesco stores. Tesco chief executive Dave Lewis said: “Jack Cohen championed value for customers and changed the face of British shopping. He’s an inspiration for all of us and that same spirit still drives Tesco now.